Britain's William Fox-Pitt wins his second Badminton Horse Trials title after a clear show jumping round on Chilli Morning. The 46-year-old, who won the title in 2004, finished ahead of Germany's Ingrid Klimke, who rode Horseware Hale Bob, while New Zealand's Jonathan Paget was third on Clifton Rush. 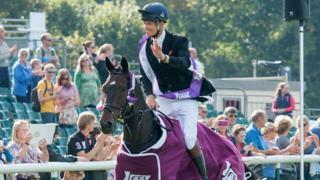 Fox-Pitt is the first British Badminton winner since Oliver Townend in 2009.